Alternative energy sources and sustainable design principles can make a big difference to your home's environmental footprint. the resources required to demolish the building, and how its byproducts are either disposed of or recycled. Regardless of how they contribute to your home’s efficiency, every material and product used in the construction of your house has a different environmental cost. Solar panels, for example, are constructed using rocks, copper, aluminium and various other materials mined from the ground, and then fabricated into silicon panels, wires, frames, nuts and bolts. Energy’s used not just to pull these things out of the ground, but also to refine them, shape them into usable parts, apply protective treatments and assemble them. The energy used to extract the materials for a product and to manufacture and transport it is known as its ‘embodied energy’. The embodied energy in an average household, according to studies carried out by the CSIRO, is somewhere in the order of 1000GJ (gigajoules). This is roughly the equivalent of the amount of energy consumed in an average household over a period of fifteen years (although this depends very heavily on how the building's designed). There’s also an environmental cost to either disposing of or recycling the products once they’re no longer being used. The lifecycle assessment approach to understanding how much embodied energy each part of your home really accounts for is the most ‘honest’ way to think about the overall environmental cost of your home. Attitudes and regulations are slowly shifting towards a stronger focus on this approach to sustainable construction, and the energy used over your house’s lifecycle accounts for a very considerable amount of a house’s overall ‘sustainability’. Where practical and possible, you should ideally aim to build using materials that have a low level of embodied energy – and take into consideration the volumes in which different materials will be used. Walls, for example, will use a lot of any given material, while smaller fittings and fixtures are likely to have far less of an impact. Also consider whether or not different parts of your house will be able to be recycled if and when your house reaches the end of its life. The way your home’s designed will also determine how much energy’s required to keep you comfortable – particularly in terms of the indoor climate. A well designed home will make good use of heat from the sun to warm the house when necessary (called passive heating), and adequate shading to keep the house cool when the weather’s warmer (passive cooling). 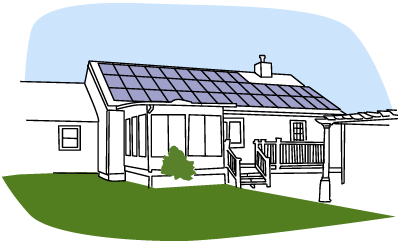 The house's general orientation and which parts are faced towards the sun makes all the difference - solar access (i.e. access to sunlight) is a big deal when it comes to heating and cooling efficiency. Heating and cooling - particularly air conditioning - can be seriously energy-intensive if a house isn’t designed to make best use of natural warmth and shade. For passive design to be truly effective, it requires a tight building envelope and excellent insulation to ensure that the climate inside the house is separated from the climate outside. Energy efficient appliances, plumbing fixtures and lifestyle considerations also play a big role in operational energy use, as does the size of your family, and how you plan to make use of things like compost, rain water and waste. The possibilities here are limitless – compost bins, rainwater tanks, biolytic toilets - there are a million different ways to reduce and reuse waste. We’re all completely addicted to electricity and the many modern toys and gadgets for which it provides life. Probably the best way to reduce your home’s ongoing impact on the environment is to generate your own electricity using sustainable energy sources like wind or solar power. Most of the power supplied by Australia’s energy companies is generated by burning coal, which is a notorious greenhouse gas polluter. As well as being able to service your own needs, a decent solar or wind setup can also feed excess energy back into the electrical grid, helping in a small way to reduce the overall net demand for fossil fuel power. Likewise, if you’ve got a battery backup system, you can also store power to be used even when there’s no sunlight or wind. In Australia, we have what's known as the Nationwide House Energy Rating Scheme (or NatHERS, for short). This system allows houses to be assessed for their thermal performance using computer modelling. Under the scheme, houses are given an energy efficiency star rating - the more stars a house achieves, the better the thermal performance, and in all states there are basic minimum star ratings that new houses need to achieve. NatHERS is a great way to get a basic idea of how much energy a house will theoretically require to keep it warm in winter and cool in summer, but it's only part of the picture. For the time being, these ratings are allocated based on modelling for the design of the home. Unfortunately this doesn't always reflect how much attention's put into making sure it's properly constructed. Star ratings are a pretty good indication of a home's theoretical efficiency, but they're not always a reflection of the thermal performance of the finished product - a serious builder who genuinely understands what's intended will make all the difference. It's also worth remembering that if you're buying a house with a given star rating, you need to know how it all works! Building or buying a ‘sustainable’ home might cost a bit more in the short term, but it’s not necessarily going to break the bank. In the longer term, things like savings in operational costs, energy independence and resale value are likely to far outweigh the extra expense of building a home with sustainability in mind.